The world has two types of clowns in it. First, there are the happy clowns. Those are the ones that show up at your kid’s birthday party to blow up balloon animals while hitting themselves in the face with a pie. Then, there is the other kind of clown. You know the kind we’re talking about. They show up in horror films. They stalk innocent people and scare the pants off of them when they least suspect it. They’re the kind of clowns that haunt our nightmares and make it difficult for us to sleep at night. We prefer the happy kind of clown. We like to sleep at night. 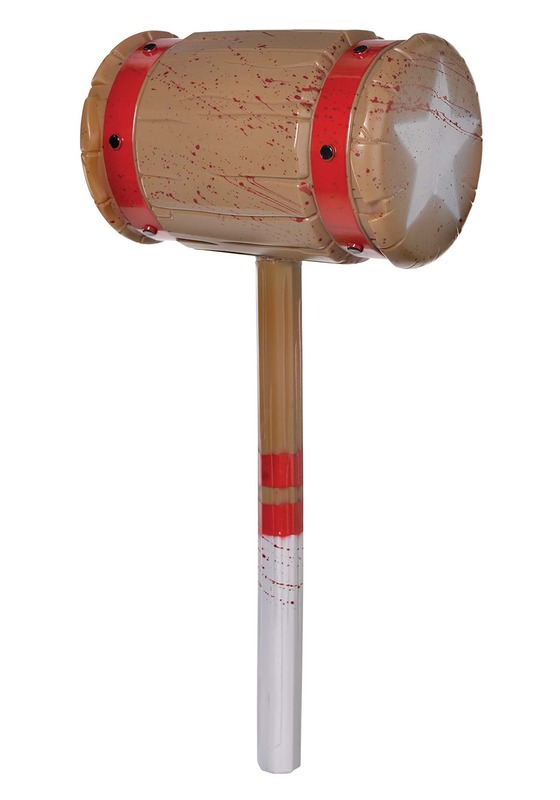 This Evil Clown Hammer, however, is for those nightmarish clowns out there. This toy accessory is shaped like a comical mallet. It’s has a giant star on the head and it almost looks like something that a happy clown would carry… except for one tiny detail. This mallet has fake blood painted all over it. We’re not sure what a friendly clown would be doing wielding a blood-splattered hammer, so we have to assume that this hammer is for all of those scary clowns out there! If you plan on dressing up like a hellish harlequin or a creepy clown, then you’re going to want this clown hammer in your hands.